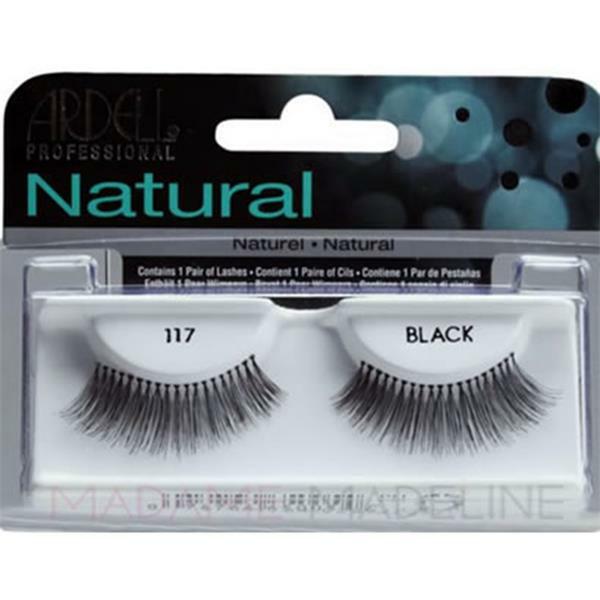 Ardell® Natural Lashes in style 117 Black are long, full, fluttery and mixed length. Add length and volume in an instant with Ardell® Natural Lashes. These lashes feature an invisible, lightweight band that connects the hair strands to form a strip that ensures secure corners. They are knotted and feathered by hand for perfect uniformity, absolute comfort and an outstanding natural look. Kit includes a mini DUO® lash adhesive. Gently flex the band so that it has a slight arch. Then align band with natural lash line to check the fit, and if necessary, trim the outer end with scissors. Apply a thin line of Ardell LashGrip Adhesive along band and wait for 30 seconds until adhesive becomes tacky. Place band against eyelid as close to the lash roots as possible. Gently press along the band out to the edges to secure. To remove: Starting from the outer edge, gently peel lash off lid. Carefully remove the adhesive from the band. To maintain shape for re-use: place lashes back on tray.